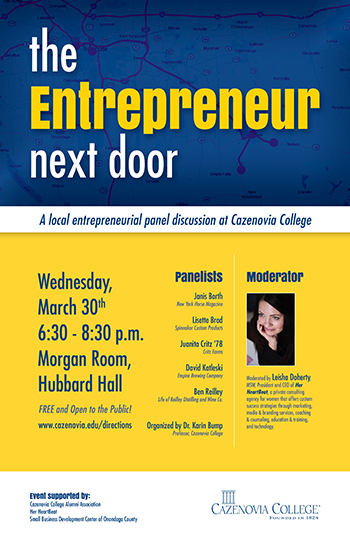 Cazenovia, NY (March 14, 2016) – Cazenovia College hosts a panel discussion about entrepreneurship with insights, tips, and advice for current and future entrepreneurs featuring local business leaders and moderated by Leisha Doherty, MSW, president and CEO of Her Heartbeat, a private consulting agency, on Wednesday, March 30, from 6:30 p.m. to 8:30 p.m. in the Morgan Room of Hubbard Hall on the Cazenovia College campus. Panelists include: Janis Barth, New York Horse Magazine; Lisette Brod, Spinnaker Custom Products; Juanita Critz '78, Critz Farms; David Katleski, Empire Brewing Company; and Ben Reilley, Life of Reilley Distilling and Wine Company. Sponsored by the Cazenovia College Alumni Association, Her Heartbeat, and the Small Business Development Center of Onondaga County, this event is free and open to the public. For more information and directions to the event, visit www.cazenovia.edu/news-and-events.